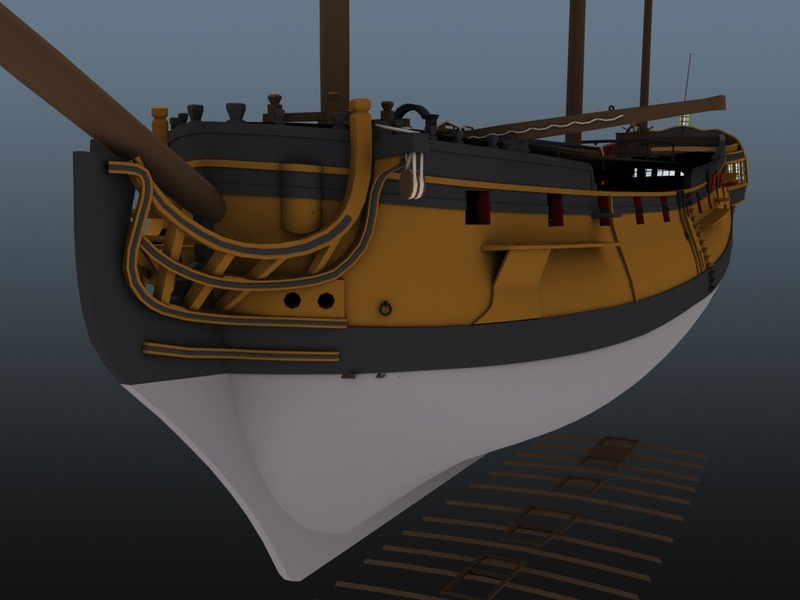 In our latest article, we're showing off working cannons, a realistic ocean, modular weapons, high-detail ships and more! After a long wait, we've got a huge amount of news to share with you regarding the exciting work in Unity and excellent models in production. It is of the utmost importance that we find at least one dedicated character artist as soon as possible. We only need one fully rigged character for the tech demo, but if at all possible we'd like to avoid low-detail placeholders (see screenshot of the weapon system below). Therefore, we really need people to take on the roles of modelling characters and clothing, to give us good looking models for the tech demo and beyond. We are still recruiting other 3D artists, and in particular we'd like to see more people willing to get their assets into Unity. In this video, Captain Murphy runs through the procedures the guns follow when ordered to fire, including swabbing, loading, running out and recoiling. An update on how the ocean renderer is working in the game, showing an improved wave system and realistic foam effects. A quick demonstration of how the player can interact with the helm to turn the ship. The video also shows how the wheel and tiller move simultaneously. We are now collaborating with third party developer Foamy to produce a fully dynamic fencing system for the game. Although we haven't finished integrating it into Hearts of Oak yet, you can get a taste of the feature set by following this link to Foamy's website. 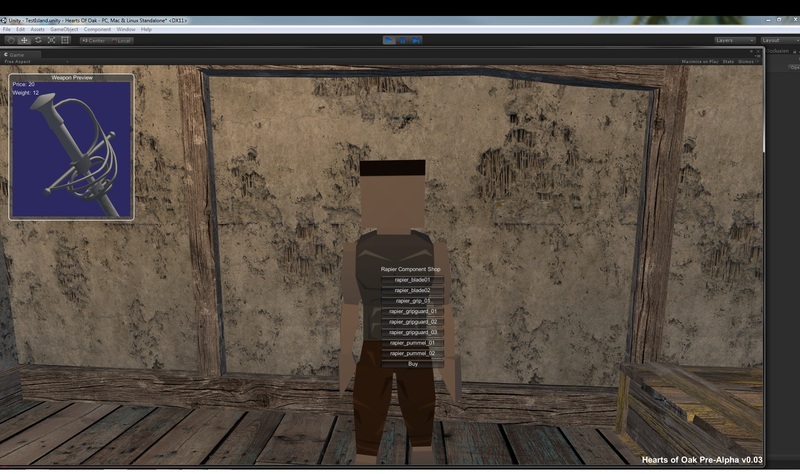 To complement the swordfighting itself, we also have modular weapons now working in the engine. Using model parts provided by SuperDurnius, the player can choose exactly what kind of sword they want by customising the grip, blade, guard and pummel. 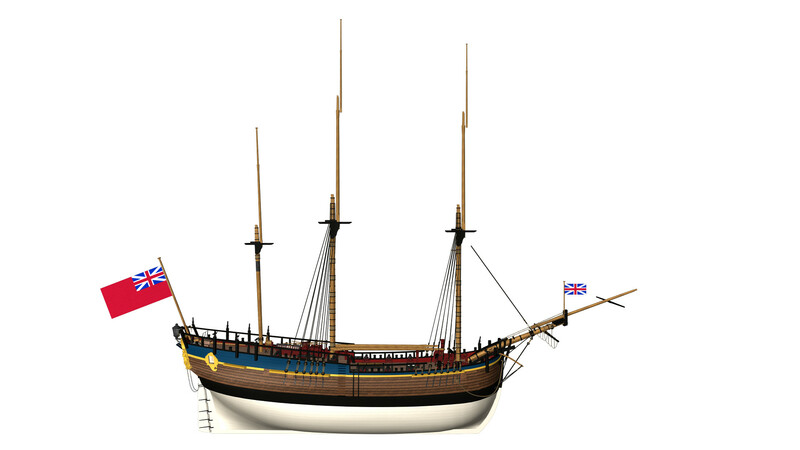 This incredibly detailed ship now has its masts and some of its rigging in place, along with reserve spars upon which the boats would be stowed. 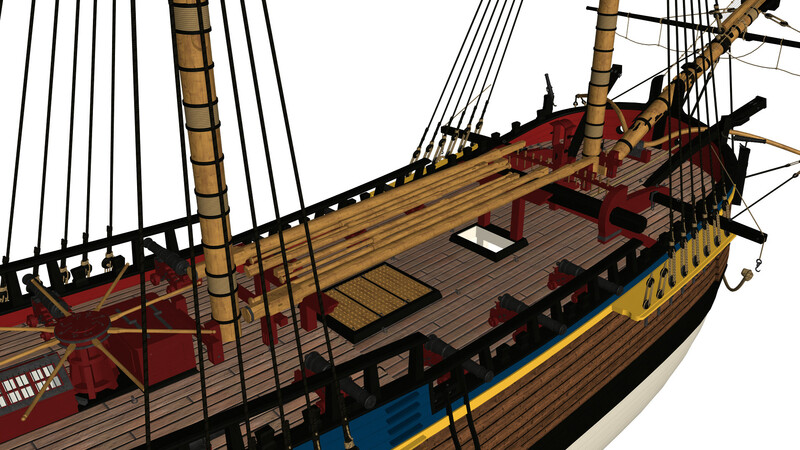 Based on a 20-gun sixth-rate originally built in 1720, the modeller is modernising this ship to be more suitable for the game's initial time period. 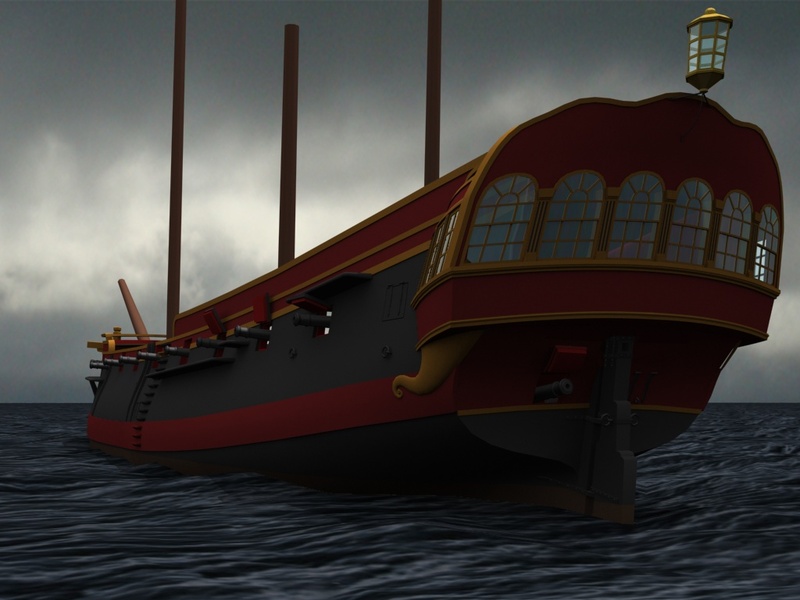 The biggest ship in active development, she now has all gunports open and is close to being ready for basic testing in Unity. Most of the finer details are being skipped for the initial tests. This week, we've got a finished version of one of Flannery's pieces named Rum Bonfire. Flannery wrote: [The title] pretty much says it all when it comes to inspiration for the music. I pictured a dusky hot summer night in some secret island in the Caribbean somewhere - and pirates dancing around a fire, arm in arm singing and drinking rum. And that is pretty much it; the themes build on people being pretty much drunk out of their minds and being silly. Trunks518 - For his tremendous contributions on the Unity Engine development; we would not have come as far in as short a time as we have without his help. His contributions have been invaluable to the game's development, and we hope to give out more of these awards soon! 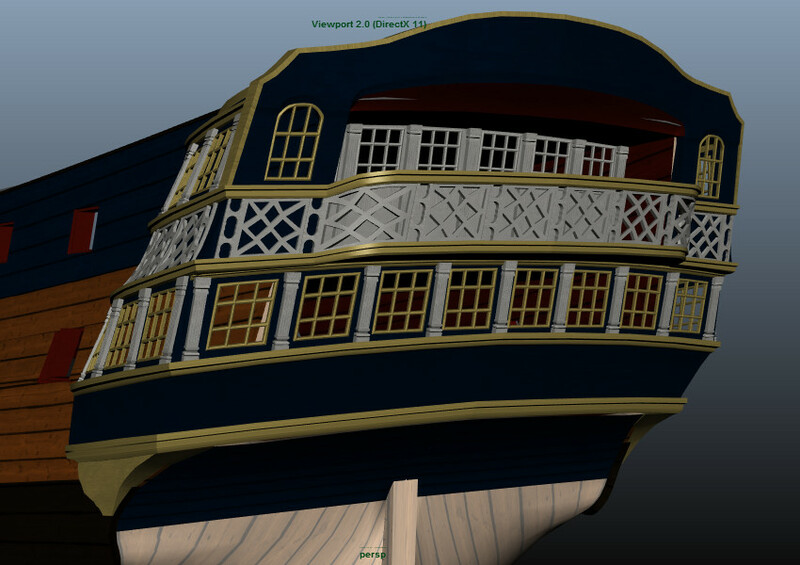 So far, we've managed to acquire a Unity Pro license for two of our developers, along with a selection of asset packs such as the Pirate Island to speed up our engine testing. I would love to know how to model in 3D, but I share this somewhere and see if you get somebody! The water looks very good for unity, the wave peaking is cool. DAMMMN I want to play it so much! I hope the commercial side of the game will be greatly expanded in comparison to AoP. I'd love to buy a gold mine or build my own plantation and just become a landmaster or perhaps a governor at a point :O Elections or appointments based on how much good one's done for an island. Think of possible coups, being rich enough to overthrow someone using the land influence instead of combat. So many possibilities! Sounds like you want to play Tropico in first person! We do have extensive trade systems in planning stages currently, but each part of it will have to be built on a previous system so it will be some time before a really in depth economy makes it in game.